I love beans & I love soup. One dish that marries the two is rich & creamy ham ‘n beans; it has always been a comfort food for me. When I make old-fashioned ham ‘n beans I always use the big ham bone usually left after the holiday ham. I often freeze it to use later. I purposely leave plenty of meat left on the bone, & there’s loads of extra flavor just waiting to be extracted from it. However, since making a big ham typically only happens once a year, so does ham ‘n beans. And alas, big hams have graced the RV convection oven, so I won’t be making it any time soon. Thank goodness there are many other great soups (with beans) to be made instead! I think part of what’s great about soup is it’s versatility. It can be a starter course, a component of or the entire meal. You can usually add or subtract ingredients if there’s something you don’t like or something else you prefer. There are soups to fit every cuisine, diet & they are often budget friendly. I also like how easy it is to divide & keep leftovers for future consumption which helps with meal planning. Since deciding to travel full-time we have lived most of these first six months with it being incredibly hot outside. It has just been within the last month that we have experienced temperatures cool enough to qualify it as “soup weather”! 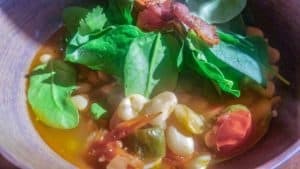 I made clam chowder this past weekend, pinto bean & sausage soup a few days later & now I am officially soup obsessed this week! Yesterday was this soup … I was very happy with it & its officially share-worthy. Baby lima bean are a lot like a (navy) white bean in texture, not as firm as the green ones. I have included a few optional ingredients you could add if you wish. As it is written, there is no meat (not counting bacon garnish!) in this version which I didn’t miss at all. With oil (or bacon fat) & butter in pan turn burner on to medium. Once the butter melts, add onion, peppers, basil & garlic. Add Old Bay & salt & pepper to season. Increase heat to med-high & Saute for 3-4 minutes until soft & starting to turn translucent. Add tomatoes to the pan & saute another few minutes. 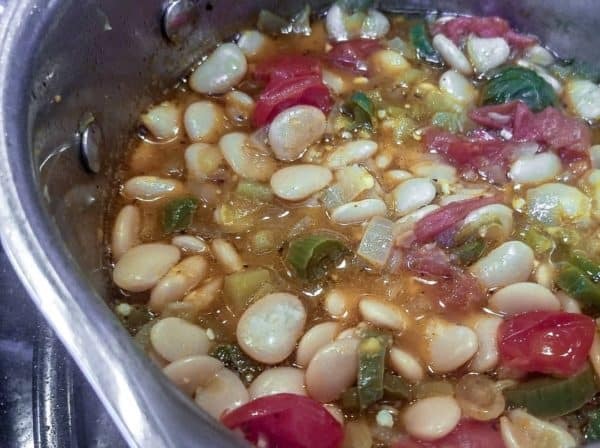 Add baby lima beans & stock to pot. Bring to a simmer & reduce heat to low simmer with lid (venting). Simmer approximately 30 minutes. Ladle into bowls & add (desired amount of) spinach on top. Add bacon pieces for garnish. Mix in and eat! This is delicious served with crusty whole grain, sourdough bread or even an Italian ham sandwich! Previous Post Rear-view mirror regrets? Do we miss our “old life”? Our stuff? Next Post Pass the Chimichurri, PLEASE! !